Q. Is a water break test similar to an atomizer test? 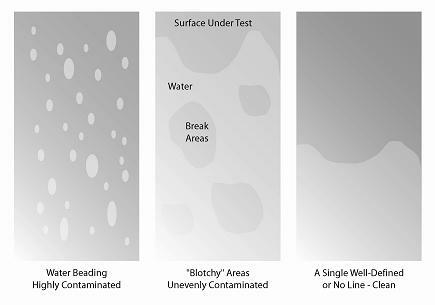 The water break test, a fairly crude test, is suitable for detecting films of process oils and heavy fingerprints. It does not readily detect non-hydrophobic residues. This test is often used for parts washing and may not be suitable for precision cleaning applications. The atomizer test is a variation of the water-break test. It involves a gently sprayed water mist. Any areas where water repulsion occur indicate the presence of a hydrophobic soil. 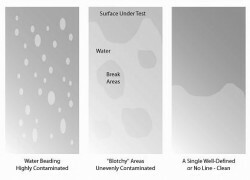 The atomizer test is slightly more sensitive to hydrophobic soils than the water break test in which the kinetic energy of the flowing water may overcome a hydrophobic residue. In contrast, the atomizer test allows you to see a small droplet of water being repelled by a hydrophobic contaminant. With over 65 years of experience in detergent manufacturing and critical cleaning expertise, trust us to solve your most difficult cleaning challenges. For a free detergent sample please visit Get Sample. To ask our experts a technical question please visit Ask Alconox.